Inside the originally Gothic moated castle at Budyně nad Ohří, partially rebuilt into a Renaissance palace, is located the Jandovo Municipal Museum. So a tour of the castle offers not just the opportunity to admire the Late Gothic and Renaissance interiors, but also to enjoy the museum’s collection. Exhibits include firearms, archaeological finds, various trophies, a stuffed crocodile and torture instruments. A popular part of the exhibition is the authentic alchemist’s workshop, which is situated in the same rooms where alchemical experiments were actually conducted in the 16th century. In this unique display you can find numerous examples of kilns, burners, vats and recipes over which alchemists would once have laboured. A Baroque pearl on the banks of the Ohře River. Libochovice Castle is situated in the picturesque landscape of the Lower Poohří, flanked by the romantic hills of the Central Bohemian Uplands. Libochovice Castle is one of the most important early Baroque structures in Bohemia. It was built in the years 1683-1690 by the Italian architect Antonio della Porta. Inside is an illustrative exhibition of interiors, which offers a cross section of different historical styles. The installation contains a lavish collection of porcelain, another of rare wall tapestries, paintings and the original Baroque tiled stoves. Beside the castle lies its extensive grounds, comprising a French garden and a rolling landscaped park. The ruins of the medieval castle of Házmburk are not far from the village of Klapý. This was the ancestral seat of the Zajíc family, although in subsequent years the title passed between several owners, among whom were the Lobkowiczs, Stenbergs, Dietrichsteins and the Hebersteins. You can only reach the castle on foot. It stands atop a basalt rock at a height of 418 m. From a distance your eye is drawn to the two massive towers – the White and the Black Tower. 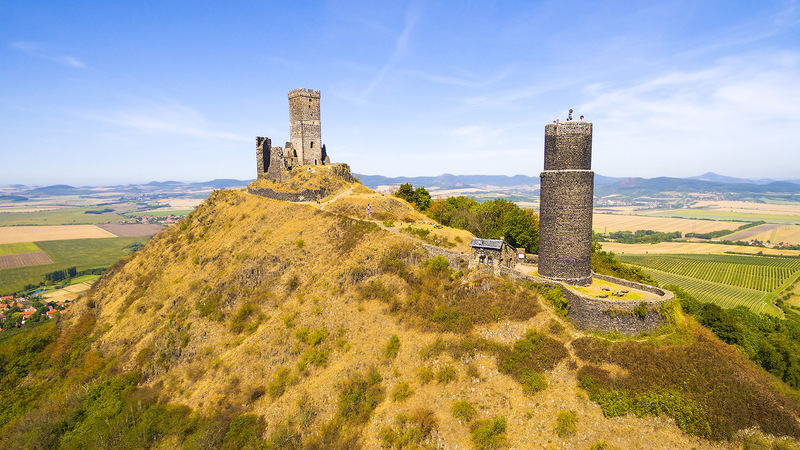 The former has been repaired and gives tourists an unparalleled view of the Central Bohemian Uplands and its shapely miniature mountains: Milešovka, Sedlo, Dlouhý vrch, Radobýl, Kletečná, Říp and Lovoš. In whichever direction you gaze, your eyes will alight on some remarkable spectacle. A legend is told of the Házmburk dragon imprisoned in the castle cellars beneath the White Tower. The castle hides remnants of a third tower, but no-one has yet explained the reason for its construction, and its ruins are today entangled beneath dense vegetation. Being one of the Czech Republic’s oldest towns, the history of Roudnice nad Labem is exceedingly rich. Rising high above the Elbe River and dominating the town is the massive castle. The Roudnice domain was the traditional princely and ducal seat of the Lobkowicz family. This 250-room Baroque castle documents the family history over the course of four centuries. The castle extends over an area of 8 hectares. Besides the main castle buildings are the associated monastery, church, farm and administrative buildings, as well as a riding hall. The Romanesque foundations of the original castle date back to the 12th century. Beneath the castle buildings extend the cellars of the Roudnice Castle winery. The family’s vineyards have been producing wine for over 400 years. Apart from the castle, you can also visit the Kratochvíl Watchtower, the old Jewish cemetery and other historical sights. Říp Mountain, which is a national cultural monument, is one of the most important places and symbols of our national history. It is central to the founding legend of the arrival of our ancestors into this landscape, and every true-blooded Czech should at least once in his or her life climb to the top. According to legend, our “Forefather Czech” came to this very place and decided to settle here. The basalt pile of Říp Mountain (456 m n. m.) is a peak visible from far and wide, rising 5 km south of Roudnice nad Labem. At the summit of the hill is one of the most famous Romanesque monuments in the Bohemia, the Rotunda of St. George, originally consecrated to St. Adalbert. Every year many marches, parades and processions, organized by a variety of groups and associations, set off to climb Říp. Mass is celebrated at the summit at 15:00 on every first Sunday of the month. The town lies above the confluence of the Elbe and Ohře Rivers. It is one of the oldest Czech towns, having been granted the status of a royal town sometime between 1219 and 1228. Since 1950 the historical town centre has been designated an urban heritage reservation, which covers a total of 44 streets and nine squares. The town is the bishopric of the Diocese of Litoměřice. In mid-September 1836, the poet Karel Hynek Mácha arrived here, renting a room at the address: No. 177 na Janských schodech, which belonged to the shoemaker Franz Lorenz. The spa was founded in 1796, which means the peat bog of Lázně Mšené has been successfully treating patients for 220+ years, especially musculoskeletal disorders; in more recent years it has also begun treating inflammation of the nerves and post-operative conditions. The architectural jewel of the spa and a protected cultural monument is the Art Nouveau Pavilon Dvorana (1905), the work of Czech architect Jan Letzel, more famous perhaps abroad than at home. His most iconic work is the Japanese Chamber of Commerce and Industry in Hiroshima. This Late Baroque chateau was built in Vrbičany during the years 1786-1789 by František Kressel from Kvaltenburk, probably on the site of a medieval stronghold. It is a two-storey building whose projecting central section has three floors. The chateau is situated not far from Lovosice. Since 2012 this previously dilapidated relic has been gradually restored. The castle park has been tidied up and the building readied for total renovation. This year will see the completion of the roofs, with the state rooms to follow one by one, while plans are afoot to turn the second floor into tourist accommodation. In future the chateau is expected to serve as a multicultural centre for the wider district. During the Second World War, Terezín played a tragic role, becoming the largest concentration camp in the Czech lands. Today the town forms one enormous memorial, reminding us of the fate of tens of thousands of Jews who passed through its walls. The Terezín Memorial contains several sites at which visitors can pay their respects. Alongside these quiet places we find exhibitions, structures and monuments designed and maintained as constant reminders of the suffering experienced here and at the same time a warning for future generations. Terezín was built in the years 1780-1790 as a fortification guarding the northern approaches to the Czech heartlands. In 1782 it was made a town, the life of which was closely connected with the military garrison. The so-called Small Fortress, which formed an offshoot to the Terezín fortification system, gained notoriety during the era of the Hapsburg monarchy as a prison and place of punishment for military and political prisoners. The town entered its most tragic period during the years of World War II. In June 1940, the Nazi occupiers set up within the Small Fortress a police prison for the Prague Gestapo, and later, on 24 November 1941, established a ghetto in the town itself. This collection and transit camp was first earmarked for Jews from the Protectorate of Bohemia and Moravia, later it imprisoned Jews from Germany, Austria, the Netherlands, Denmark and Slovakia. An exhibition of cars and motorcycles from the socialist era in particular from 1960-1990. You can check out models manufactured by Trabant, Wartburg, Škoda, Tatra, Dacia, Lada and Moskvič. The museum also has vehicles that once drove the roads behind the Iron Curtain, such as vehicles manufactures by Mercedes or Fiat. Milešovka is the highest mountain in the Central Bohemian Uplands. Its summit lies at an altitude of 836.5 m. Its name is borrowed from the nearby municipality Milešov (2 km). The mountain has been declared a national nature reserve (51.3 hectares, since 1951). Since Milešovka is significantly higher than any other peak in the Central Bohemian Uplands, the summit of the mountain offers a 360° panorama stretching as far as the eye can see. For the same reason, this spot is reckoned to have one of the toughest climates in Bohemia. It’s regarded as the country’s windiest mountain, there being only eight calm days a year here. In the 1820s one of the very first mountain restaurants in Bohemia was erected here. In 1905 a weather station was built, followed shortly after by 19 m tall watchtower. Today, the mountain still plays host to a weather station, operated by the Institute of Atmospheric Physics, CAS. In favourable weather the watchtower is opened to the public. The tower houses a permanent exhibition, and the ascent is usually accompanied by an expert talk on the history and findings of meteorological observation. This pronounced 570 m high conical mountain north-west of Lovosice dominates the local district thanks to its massive stature, graceful shape, precipitous slopes and its location above the flat Polabí lowlands. From a geological viewpoint, the mountain is made of basalt minerals. The neighbouring peak of Lovoš (80 m lower), also called Kibička or Malý Lovoš, is composed instead of clinkstone. The southern and south-western slope of the mountain are enlivened by rocky and scree-strewn parts, with grassy steppe and bushy forest steppe stands of vegetation. Thanks to its priceless natural value (rare flora and fauna) the area covering Lovoš and Kybička was decreed nature reserve in 1948, with a total of 50 hectares. At the summit is a hiking hut with a restaurant. You can reach the top by following the green marked footpath out of Lovosice, or by taking the blue path out of Oparno. The chalet is open every Friday from 15:00-22:00, Saturdays from 10:00-22:00 and Sundays/public holidays from 10:00-16:00. Porta Bohemica, also known as the “Bohemian Gateway” is the name for the canyon-like valley of the Elbe, whose meanders create truly beautiful natural scenery. Porta Bohemica can be appreciated from many viewpoints, for example from the chapel in Dubice (on the left bank of the Elbe) or from the summit of the Calvary near the village of Velké Žernoseky (right bank of the Elbe). Accompanied by the elf Portáš, you can hike a nature trail that visits lots of interesting places. This can be enjoyed in stages, or as a longer hike in one go. Walkers traverse the territories of 10 different municipalities, in each of which you are told tons of interesting stories, anecdotes and legends as you pass on your way. The trail contains 16 stops, where in addition to learning new information you can test your existing knowledge, as well as your dexterity, skill and ability to uncover hidden secrets. The trail starts in Lhotka nad Labem, wends its way through the beautiful Opárenské Valley and ends at the village of Žalhostice. The entire route is 30 km long.